This is the premier educational opportunity for Property Management professionals who manage personal property for universities, federal, state and local governments and private industries. Columbus City Schools in Columbus, Ohio, has improved the accuracy and efficiency of its asset management program with a bar code-based asset tracking system. The Columbus school system includes approximately 130 facilities, each of which houses a number of high-value audio-visual, computer and other assets. The district previously managed its assets using a relational database program based on asset information that was collected manually during biannual inventories, and through asset lists that the principal at each school was charged with updating. “Each year they were supposed to send us listings of disposals and additions they had made,” says Phil Watson, accounting manager, school support, Columbus City Schools. The District put out a request for proposal (RFP), and selected BarScan based on its ability to easily import existing asset data. “We also appreciated that BarScan is fairly intuitive and easy to use,” Watson adds. The system was deployed in June 2007, over a period of just a few days. Watson’s team was able to integrate the bar code technology quickly, in part because the existing asset tags used by the school system were already bar coded. Watson says the district spent a few months after the initial deployment working with its database to ensure the entries were consistent. Watson’s team exported data on its existing 40,000 assets into an Excel spreadsheet, which was imported into the BarScan Asset Management System. The school district uses the system to track capital assets with a purchase price of over $5,000, and computer and AV equipment that costs more than $500. Auditors use hand-held bar code scanners from Symbol Technologies to complete physical inventories. The PDA-style devices upload and download data via a cradle connection. Bar|Scan will be exhibiting at the GSA Small Business Conference in Indian Wells, California on December 13, 2006. Come visit us December 13, 2006 at the Renaissance Esmeralda Resort, Indian Wells, California. The GSA conference is a meeting place for small businesses interested in expanding their business through Government Contracts. See www.gsa.gov/caevent for more information. Bar|Scan is currently installed in several GSA regional offices. Bar|Scan’s President, Andreas Schiffer completes research report on “Automated Asset Inventory System” for the Arizona Department of Transportation in cooperation with the US Department of Transportation. Aperture VISTA is an enterprise software solution which reduces operational risk and improves efficiency through the visual management of the data center. Aperture VISTA delivers the key processes that enable organizations to take control of an increasingly complex physical environment including equipment, space, power, environmentals, network and storage. 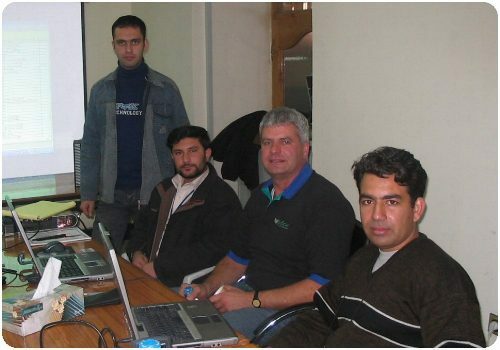 Below is a Bar|Scan training session held in Kabul. Bar|Scan training sessions can be held at your facility or ours. Recent sessions were completed in Bogota – Columbia, Toronto – Canada, Boston, Denver and New York as well as our headquarters in California. Shown is a session in Bogota.